Cantonese jellyfish. Credit: Wikimedia Commons. Back in 2015, we here at HEXAPOLIS talked about how deep-friend iguana could end Puerto Rico’s rapidly growing infestation problem, as proposed by the country’s scientists. Well, fast forwarding to 2017, Danish scientists have put forth a similar proposal involving culinary solution when it comes to tackling jellyfish blooms in certain parts of the world. Now just to be clear, jellyfish (of the order Rhizostomeae) is consumed in China and many parts of South East Asia for over a millennium, through culinary concoctions like soups and salads. However the Danish scientists want to make this consumption pattern global in scale, considering not only the ecological unbalance of jellyfish blooms, but also thinking on the lines of how to diversify our diets – especially in the context of the rapid growth of human population. 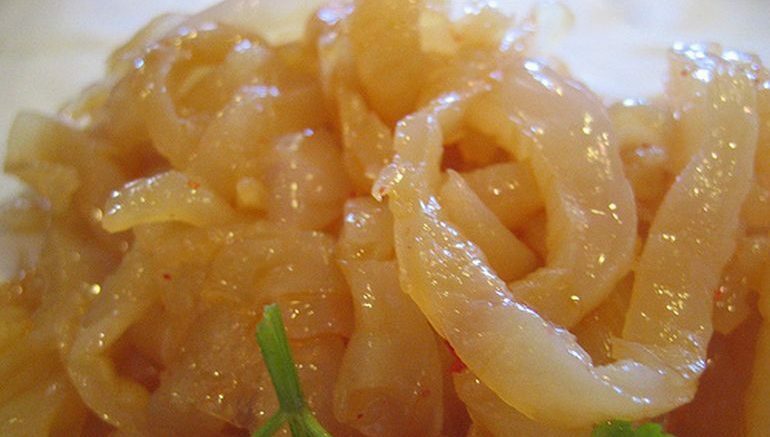 To that end, in some segments of culinary industry, the conventional method before consuming jellyfish entails a fresh processing part, for mitigating the liquefaction, odor and the growth of spoilage organisms. 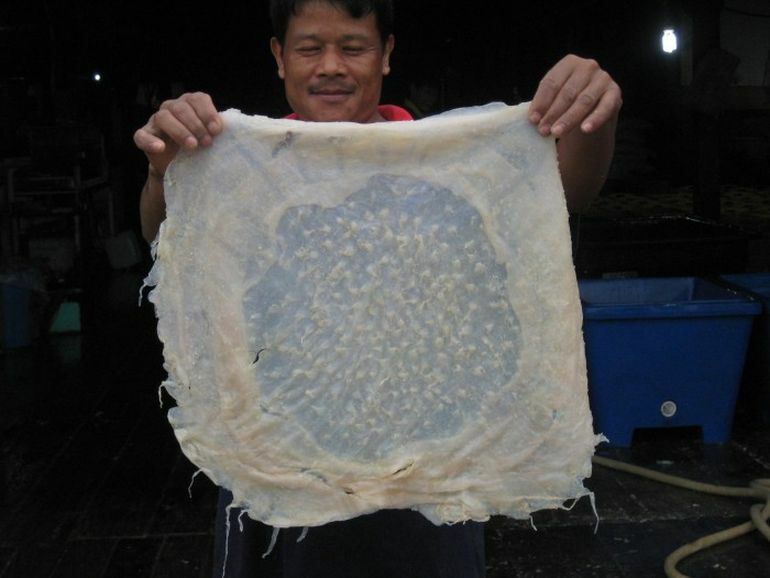 The month-long process requires the jellyfish to treated with a mixture of table salt and alum (a compound also used for leather tanning), and then compressed for the ‘crunchy and crispy’ texture. However in practical scenarios, the steeping liquid in itself is often kept secret by various establishments, while the chemistry behind the entire method is also a bit vague. In the course of a couple of days, the alcohol replaces the water in the jellyfish. In the subsequent evaporation process they become bone dry. The mouth feel and the aesthetic appearance in particular have gastronomic potential. Suffice it to say, with this ‘success’, the scientists look forth to a commercial scope that is economically viable when it comes to consumption of jellyfish as a source of protein (a processed specimen contains around 6 percent protein, though scientists have still not divulged the nutritional value of a fried one). Their treated end-product also tastes different from the ones preserved traditionally for Asian cuisines, thus allowing both of the dishes to co-exist in a competitive food industry. But most importantly, the Aurelia aurita species is expected to become invasive in some sectors of the Baltic Sea. In essence, mass-consumption of the organism can potentially solve an ecological predicament in the region. The study was originally published in the International Journal of Gastronomy and Food Science.